Because I have been known to hang out with lefties, my position that the oil guys are not the enemy is quite a minority one. Part of this is personal�I have relatives who have devoted their careers to the difficult proposition of finding, transporting, refining, and selling the most interesting fuel source humanity is ever likely to find. In Tioga North Dakota, I went to high school with the children of the geologists and engineers that found oil in DEEP locations and ran the local refinery. So I KNOW these people are not monsters. I also know they are not stupid. My two lab partners in high school chemistry were sons of working refinery chemists and were amazingly comfortable and graceful around the subject. There are two blindingly obvious truths associated with the oil business. The modern world is so reliant on liquid fuels that if one major oil company shut down for a month, there were be lines and buyer's panics like in 1973. If ALL of them shut down, life as we know it would come to an end. We NEED these folks. Of course we need to prepare ourselves for the end of the Age of Petroleum by building systems that do not need oil. This will be harder and more expensive than almost anyone admits. This absolutely necessary project will be most certainly powered by liquid fuels. We need petroleum to build the society that does not need it. See. Making an enemy of the oil business is not only stupid, it demonstrates amazing ingratitude for some of the people that keep the rest of us alive. And here is a remarkable demonstration of my basic point. In 1991, Shell produced an accurate and informative film on the dangers of climate change. My guess is that if the crazy neoliberal political-economic zeitgeist had not been in its ascendency during that exact moment in history, Shell might have led the march into the post-petroleum economy. But the Euro was approved at Maastricht in February 1992 so neoliberalism was nearing one of its greatest triumphs. Unfortunately, neoliberalism is perfectly incapable of financing the kind of economy that can build the infrastructure necessary to eliminate the need of fossil fuels. So Shell went back to business as usual. Not very brave or imaginative, but under the circumstances, absolutely understandable and predictable. Shell�s 28-minute film, called Climate of Concern, was made for public viewing, particularly in schools and universities. It warned of extreme weather, floods, famines and climate refugees as fossil fuel burning warmed the world. 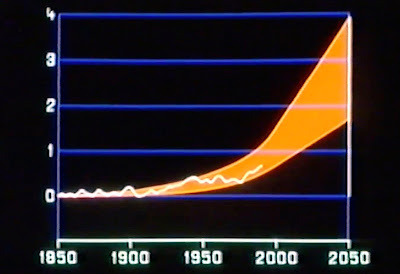 The serious warning was �endorsed by a uniquely broad consensus of scientists in their report to the United Nations at the end of 1990�, the film noted. But, despite this early and clear-eyed view of the risks of global warming, Shell invested many billions of dollars in highly polluting tar sand operations and on exploration in the Arctic. It also cited fracking as a �future opportunity� in 2016, despite its own 1998 data showing exploitation of unconventional oil and gas was incompatible with climate goals. The film was obtained by the Correspondent, a Dutch online journalism platform, and shared with the Guardian, and lauds commercial-scale solar and wind power that already existed in 1991. Shell has recently lobbied successfully to undermine European renewable energy targets and is estimated to have spent $22m in 2015 lobbying against climate policies. The company�s investments in low-carbon energy have been minimal compared to its fossil fuel investments. Another oil giant, Exxon Mobil, is under investigation by the US Securities and Exchange Commission and state attorney generals for allegedly misleading investors about the risks climate change posed to its business. The company said they are confident they are compliant. In early 2016, a group of congressmen asked the Department of Justice to also �investigate whether Shell�s actions around climate change violated federal law�. Prof Tom Wigley, the climate scientist who was head of the Climate Research Unit at the University of East Anglia when it helped Shell with the 1991 film, said: �It�s one of the best little films that I have seen on climate change ever. One could show this today and almost all would still be relevant.� He said Shell�s actions since 1991 had �absolutely not� been consistent with the film�s warning. A Shell spokeswoman said: �Our position on climate change is well known; recognising the climate challenge and the role energy has in enabling a decent quality of life. Shell continues to call for effective policy to support lower carbon business and consumer choices and opportunities such as government lead carbon pricing/trading schemes. �Today, Shell applies a $40 per tonne of CO2 internal project screening value to project decision-making and has developed leadership positions in natural gas and sugarcane ethanol; the lowest carbon hydrocarbon and biofuel respectively,� she said. Patricia Espinosa, the UN�s climate change chief, said change by the big oil companies was vital to tackling global warming. �They are a big part of the global economy, so if we do not get them on board, we will not be able to achieve this transformation of the economy we need,� she said.